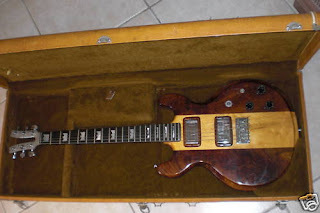 Dennis Berardi founded the BKL Corporation together with Gary Kramer and former Norlin executive Pete LaPlaca in 1976 to produce Kramer guitars. Gary Kramer, who worked previously with Travis Bean, brought to BKL a number of design concepts borrowed from his former business associate -- most notably the aluminum necks. Kramer left BKL soon after the company got started. His name, however, stuck. The Kramer 450 and 650's featured proprietary humbucking pickups, Les Paul-style electronics and exotic woods. The aluminum necks were designed to eliminate dead spots and were resistant to warping and weather and temperature changes. Probably from lessons learned from Travis Bean, natural wood was inlaid on the back of the necks to add warmth to the cold aluminum to make the neck more comfortable play. But Kramer (and Travis Bean) would have done better if they had included a heater in the case. These were the original Kramers -- several years before they entered the era of 'hockey stick' headstocks, Floyd Roses and a certain virtuoso endorser named Eddie.